Tava louca pra fazer um make azul com a paleta da semana passada da #penteadeiracápsula! Misturei com um tom de roxinho e lilás, e claro um detalhe de glitter! Mas o destaque mesmo fica pro azul navy! 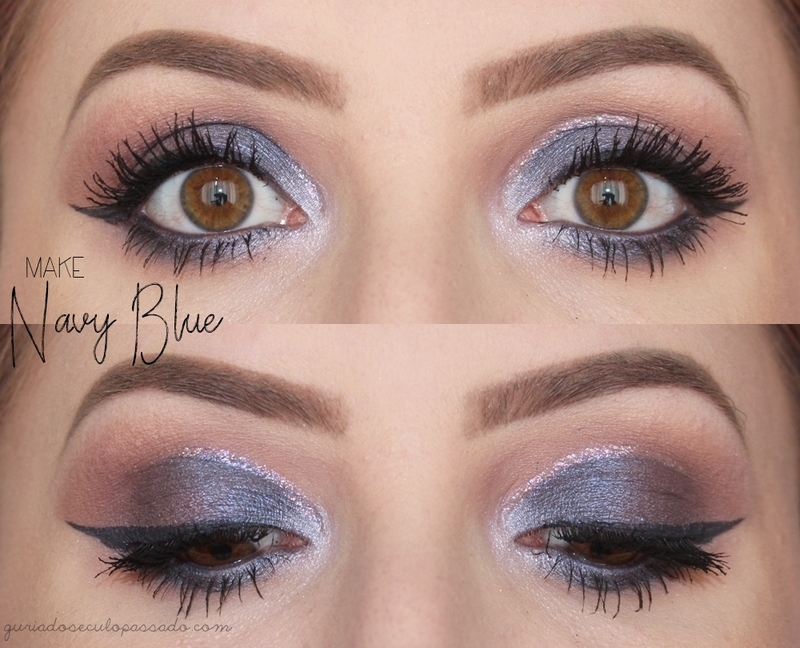 I was very inspired to do a blue makeup tut with the palette of last week's #makeupdrawer! I mixed with a purple and lilac shades, and of course, I had to add a detail of glitter! But the main color was navy blue! Começo iluminando abaixo da sobrancelha com uma sombra branca opaca (Branquin) e esfumo o côncavo e canto externo com uma sombra marrom rosada (Nunete). I begin highlighting the brow bone with a matte white eyeshadow (Branquin) and blend in the crease and the outer corner with a matte pinkish brown eyeshadow (Nunete). Aplico uma sombra azul cintilante (Azulês) em cut crease do canto interno até o meio da pálpebra e no canto externo aplico uma sombra roxa cintilante (Lilases) mesclando com o azul. Traço uma delineado gatinho fino. I apply a shimmery blue eyeshadow (Azulês) in a cut crease from the inner corner to the center of the lid and I apply a shimmery purple eyeshadow (Lilases) mixing with the blue. I do a thin winged eyeliner. Passo um lápis preto na linha d'água, esfumo a sombra marrom rosada (Nunete) rente aos cílios inferiores e por cima aplico a sombra azul (Azulês). Ilumino o canto interno com uma sombra lilás cintilante (Lilax). I apply a black eyeliner in the waterline, blend the matte pinkish brown eyeshadow (Nunete) close to the lower lash line and over it, I apply the shimmery blue eyeshadow (Azulês). I highlight the inner corner with a light shimmery lilac eyeshadow (Lilax). Contorno o cut crease com um delineador de glitter rosa e finalizo com bastante máscara pra cílios! I apply a pink glitter liner in the edges of the cut crease and finish applying lots of coats of mascara! Pode babar? Pois eu babei por essa make! Que maquiagem mais linda, seu delineado ficou tão perfeito. Amei os tons que você usou! oh dear! your eyes are looking so beautiful! Essa combinação de azul, roxo, lilás e esse glitter absurdamente lindo rosa é um encanto, o resultado é perfeito.